Trouble-free operation is the key to getting the most energy from a wind turbine. SINOI therefore recommends regular maintenance of rotor blades during their life span. Skilled maintenance must be based on a close inspection of the blade, inside and out, which takes place beforehand. Damages, which could arise from lightning strikes, general wear and tear or climatic conditions for example, can be recognised sooner in the course of regular maintenance and competently repaired. Any cleaning and sealing of surfaces can be administered as required. Special protective foil also reduces erosion damage. 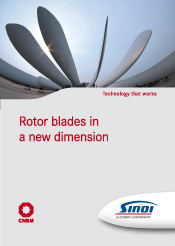 The SINOI maintenance concept ensures the durability of rotor blades whilst also optimising operating costs. SINOI provides maintenance services at reasonable prices through optimal access methods in close cooperation with experienced partners. 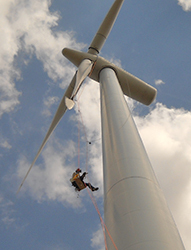 From the base to the very top, access to all parts of the rotor blade is enabled by a system of ropes or a lift platform. Specially trained and experienced workers conduct thorough inspections and maintenance works.